Thank you all for the congratz wishes on Kira's birthday. The first pic, is from our very first girls morning. She loved it so much. Last post, I didn't had time to take a pic of the last gift for Kira. She has a doll-bed, and I made some bedding for it. And there she is, in this beautifull bed!!! It still needs a mattress, and the bed needs to get painted. Also next week I;m starting on a crochet blanket for it. 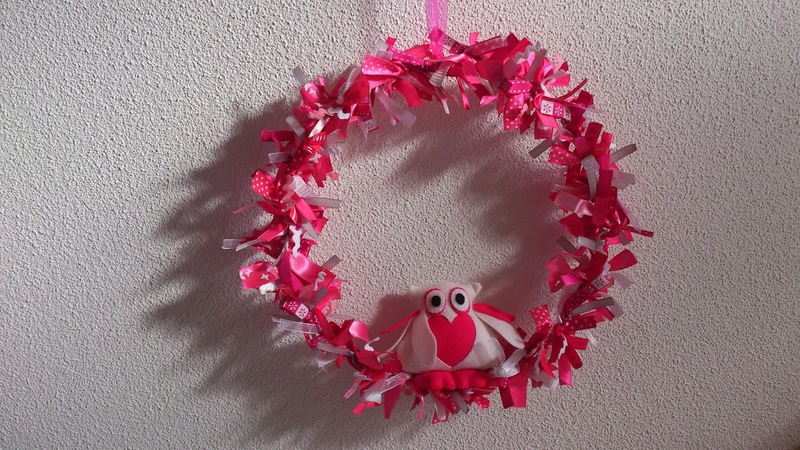 In Holland they started the Dutch Crochet Alone 2014. It's a awesome piece, started on the 3th of January, beacause mine will be small I can keep up with it, but more of that next time!! Last year a colleague asked me to make her a special piece for her Godson who was expecting a baby girl. It was the piece with the 250 pieces of ribbon. Remember that I told you about that???? It's was a big project.. So tonight I;m doing some felt peanut craft, more of that later. Have a great evening, night, mornning and afternoon, where ever you live!! My sweet friend Petra, after being addicted to not only cross stitch but also crochet and felting ( I;m innocent ) decided to write on her blog again. Please all go have a look at her beautifull blog. She also decided to write in English, so easy to read. Je krans met uiltje is geweldig. Wat een hoop lintjes heb je daarvoor nodig. En je dochter wordt al een echt dametje. The ribbon gift looks very sweet !! Luckiest doll and little girl in the world! 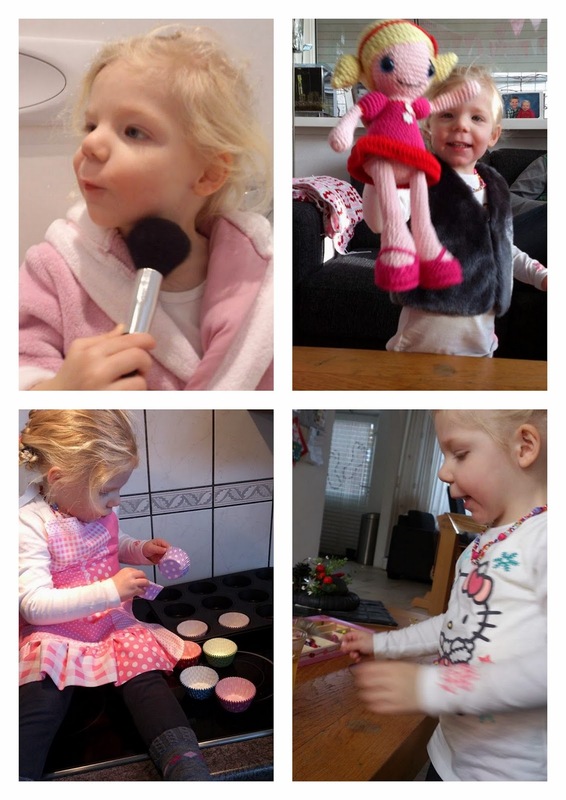 Love the photo of Kira applying blush! How cute! Oh, you are so lucky to have a daughter to have a "girl's day" with, Annette! Little Kira is so sweet with all of her pink presents :) And the wreath for your friend turned out great--I can imagine that cutting all of those ribbons was very tiring!! Hope you are having a warmer winter than we are--it is -7°F here this morning and all the schools have closed once again. Her doll has a crib!! How cute is that :D Great work! Hugs to you my sweet friend!! This is my first visit to your lovely blog. Happy birthday to sweet Kira. All the presents you made for her are gorgeous. a great beautiful patchwork ! and your wreath, wow, very pretty ! sure your colleague loved it !!! Lovely ping blog post. :) I love it!!! I forgot to say something VERY important! !